Gil Institute therapist, and Katie Fallon provided a group experience that focused on young boys with dysregulation. This group gave children opportunities to develop mastery, appropriate boundaries, and empathy. 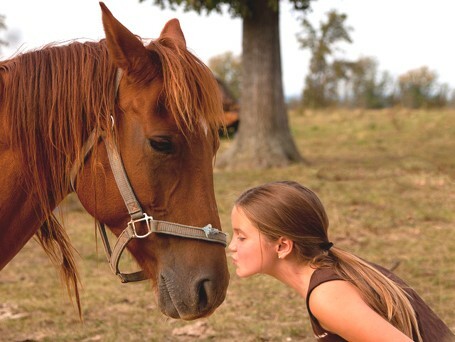 Equine-assisted psychotherapy (EAP) is a unique form of psychotherapy that uses horses as a therapeutic tool that has the potential to address a broad range of social, emotional, and behavioral problems. EAP is an experiential therapeutic approach that addresses treatment goals using collaborative efforts among a horse professional, licensed therapist, the horse, and the client. Each client-driven session includes hands-on activities with the horses, as well as processing of feelings, behaviors, and patterns to enable clients to learn about themselves and others. Clients interact with the horses on the ground, using non-verbal communication, problem-solving, and creative thinking to address a variety of mental health and developmental issues, including: depression; anxiety; sibling, parent, and family conflicts; behavioral issues; communication disorders; attention deficit disorder; and post-traumatic stress (PTS). Email Katie Fallon at Bridle Paths directly.